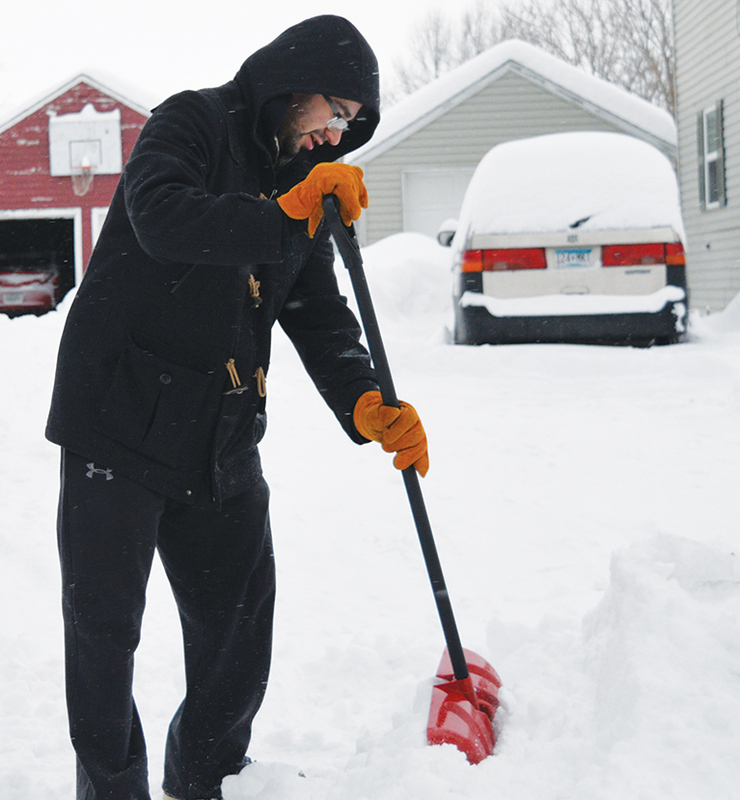 Photo by Jenny Kirk Benjamin Olson works to clear snow in his driveway on Wednesday in Marshall. Blowing snow and icy road surfaces created some difficult driving conditions throughout southwest Minnesota on Tuesday. Although snowplow crews are at work in the region, the Minnesota Department of Transportation said many roads remain partly or completely covered. Cold temperatures have slowed the effectiveness of road treatments, MnDOT said. Slick and snowy roads also meant more crashes. Sgt. Troy Christianson of the Minnesota State Patrol said dozens of vehicles went off the road Tuesday afternoon and evening, all across the southern part of the state. In State Patrol district 2300, a total of 37 vehicles ran off the road between 2 p.m. Tuesday and 2 p.m. Wednesday. District 2300 includes 13 counties in the southwest corner of Minnesota, including Lyon County. On Wednesday, MnDOT urged drivers to exercise caution as a second round of snow and freezing temperatures continues today. Snow accumulations of 4-6 inches are possible, as well as blowing and drifting snow. Two people were injured in a three-vehicle crash on Interstate 90 in Nobles County, the State Patrol reported. At 3:14 p.m., a Ford Fusion, a Ford Explorer and a Mazda CX-5, all westbound, collided, the State Patrol said. Road conditions were snowy and icy at the time. Two of the drivers involved in the crash, 27-year-old Cody Vander Ziel of Hardwick, and 44-year-old Dana Kemper of Worthington, were taken to the Luverne emergency room with non life-threatening injuries, the State Patrol said. A Walnut Grove man was also hurt in a crash on U.S. Highway 14 in Springdale Township, Redwood County. At 1:35 p.m. Tuesday, a 2009 Toyota driven by Nhiachou Xiong, 69, went off the road and struck a tree, the State Patrol said. Xiong was taken to Sanford Tracy Medical Center with non life-threatening injuries. Local law enforcement were also busy with calls for assistance from motorists as driving conditions got worse on Tuesday afternoon. Between 3 and 6 p.m. Tuesday, the Lyon County Sheriff’s Department reported 10 calls for assistance around the county, and one property damage accident. The crash was reported on West Main Street in Marshall at 3:52 p.m. In that same 3-6 p.m. time period, the Marshall Police Department reported 16 calls for assistance, as well as a crash reported at 3:32 p.m. at the intersection of Tiger Drive and Minnesota Highway 23. Four of the calls Marshall Police responded to happened at the same intersection — Saratoga Street and Minnesota Highway 23.